Is THIS bridge pictured above in the shape of a Möbius band or merely “associated” with a Möbius band as the article suggests? If it is a Möbius band, where is the half-twist? Do you think that the bridge is beautiful? 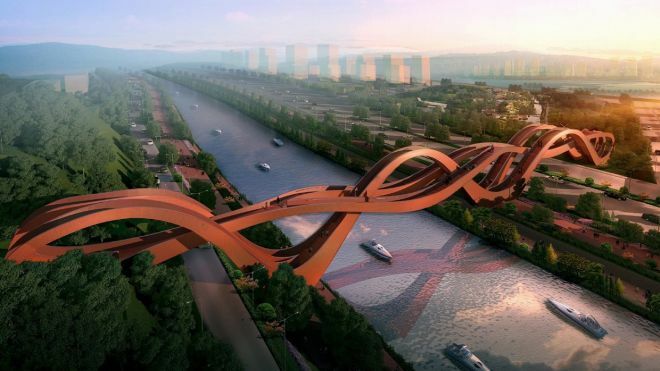 The architects have proposed that such a bridge be built in China. Can you imagine a Möbius band being used for a road? There was “A subway named Möbius,” to quote the title of a light-hearted 1950 short story by A. J. Deutsch. It was published in the wonderful 1958 book Fantastia Mathematica. The bridge above is only a concept. Other one-sided surfaces have inspired architectural designs that have actually been built. Here’s a house made in the shape of a Klein bottle. A bit of mathematical humor. One person comments on the Klein bottle that he likes the house’s orientation. Well, if it were a true Klein bottle, it wouldn’t be orientable at all! This entry was posted in Uncategorized and tagged architecture, Dr. Chase, one-sided surfaces, topology by genechase. Bookmark the permalink. Not orientable at all?! That sounds like a rather one-sided argument to me.